"It's an elegant curve before it's a sundial," says Kate Pond, considering her 2010 sculpture "Come Light, Visit Me." On a recent overcast morning, it appears to float in a bed of tall grass and wildflowers on the campus of Champlain College. "It's abstract before it's functional," Pond adds. "Come Light, Visit Me" is a single piece of Corten steel in a curlicue shape; the medium's signature, rusty patina contrasts with the green summer foliage. It's not only a striking contemporary sculpture; Pond's creation, installed outside Perry Hall on South Willard Street, has been precisely measured and sited to tell solar time. The "elegant curve" that Pond, 75, refers to is a gnomon — the piece of a sundial that casts a shadow and enables viewers to figure out the hour. Specifically, the vertical shadow cast by one end of the sculpture's curve is close to Eastern Standard Time, while the shadow cast by the opposite end is close to Daylight Savings Time. (Solar time is slightly different from clock time since the sun's position differs by longitude and latitude even within time zones.) Circles etched into the metal mark the passage of time. At noon on the year's two equinox days, a horizontal shadow hits the exact midpoint of the steel piece. Sponsored by Burlington City Arts, Pond is leading a retrospective bus tour this Sunday, July 20, to view about a dozen of her public and private works across the state, dating from 1973 to 2010. 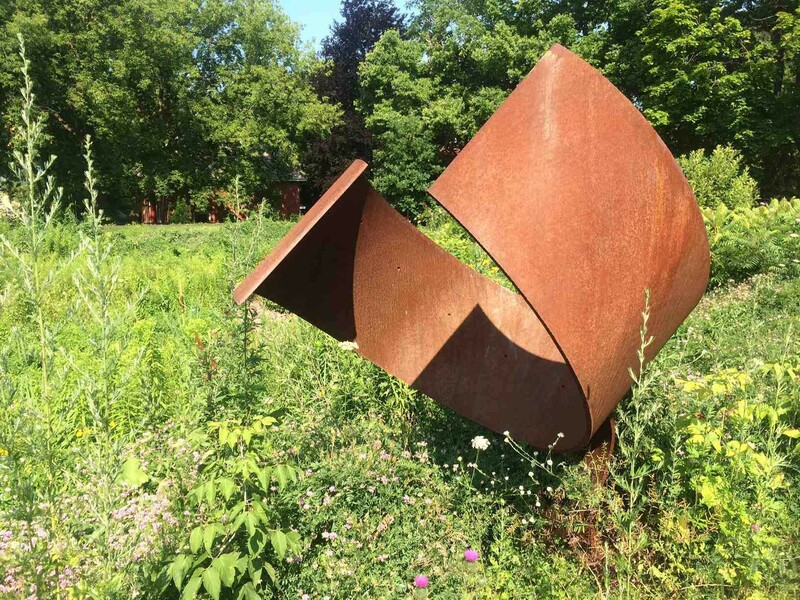 These include recent work such as the sundial at Champlain College and public art such as "Kiss II," the pair of interlocked "F" shapes outside of the Fletcher Free Library in downtown Burlington. Pond has also installed privately commissioned pieces on properties in Burlington, Stowe, Orwell and Whitingham. A seat on the 54-seat bus costs $100. That's because the tour is also a benefit for the World Sculpture Project, a decades-long undertaking of Pond's. Since the early 1990s, she's installed sculptural sundials in locations including the Colby Curtis Museum in Stanstead, Québec ("Zig Zag"); the Norsk Museum in Oslo, Norway ("Solekko"); and the Mitsubishi Sports Garden in Japan ("Himiguri"). Time capsules are buried in or around each of these sundials. Young students, mostly of elementary-school age, from Canada, Norway, New Zealand, Japan, Vermont and other locations across the United States contributed artwork and letters to those capsules over the years. Pond — a longtime arts educator with the Vermont Arts Council — dreamed up the idea of having students contribute to the sundial projects while working at the Williston Central School in the early 1990s, the period in which she was creating sculptural sundials in Québec and Norway. The idea took off in each new place where she installed a sundial. Pond estimates that more than 2,000 students have contributed small pieces of artwork to the capsules. "It's been my life's work," she says simply. Pond is by no means exclusively a sundial sculptor. She began making those in the early 1990s, but has an impressive body of work dating far beyond that. Raised in Montpelier, she took classes in painting and sculpture as a student at Skidmore College, and later at the Louvre in Paris. She got into making large-scale sculpture while studying under Paul Aschenbach at the University of Vermont upon her return to the state. Pond's first public installation was "Kiss II," the piece outside the Fletcher Free Library, but she had created and exhibited work throughout the 1970s. Pond estimates she's made about 93 sculptures, 19 of them sundials. She says her art has always been inspired by an exploration of connection and place in the universe. Working with the sun and a sculpture's placement in physical space gives her creative parameters for that heady-sounding exploration — as well as a universal point of interest, as people everywhere relate to time and the sun's passage through a day. "Much like a painter would use a rectangle for reference, for doing designs inside of that shape, I like to use the lines that connect between the stars and the sun, and the position of a piece on the earth," Pond explains. "The gnomens always point to the North Star." Pond, who turns 76 in August, says she's looking forward to seeing the artwork — and to meeting with many of the students who contributed. The bus tour retrospective and the ceremonies planned at the World Sculpture Project sundials, she says, will offer her a chance to reconnect with the work and the people involved while she can still travel. Seats on the Vermont bus tour can be purchased here.